Singer Simple 3221 has good features but it loses out on ease of use and durability. Singer could have done a better job with this machine. You might not have heard much about Simple 3221 in US. Yes, it is not as popular as the Tradition 2259, which is the most popular Singer machine in the around $100 price category. Even though 2259 is the most popular machine, Simple 3221 is the more advanced one. When compared to 2259, Simple 3221 comes with a 1-step buttonhole which is more beginner friendly than having to deal with a 4-step one. Now let us have a closer look at Singer 3221. Singer 3221 has 21 built-in stitches on-board, which includes 6 Basic, 5 Stretch, 9 Decorative and 1 Buttonhole stitch. The automatic needle threader is a huge time saver and it also eliminates eye strain. The machine comes with a 1-step buttonhole. It is a nice thing that Singer included 1-step buttonhole in this machine as most in this price range comes with 4-step buttonholes (Brother machines are an exception though). The stitch length can be easily adjusted using the stitch length dial. Stitch selection is also done by turning the dial. 5mm is the maximum stitch width that can be set on this machine. For the price, Singer 3221 has a powerful motor inside. The motor can deliver 750 stitches per minute (which is very powerful in the category, pretty impressed with that). The extra high presser foot lifter allows more clearance while working with bulky fabrics. The automatic reverse sewing button is conveniently placed, the size of the button is very good for elderly people to locate. To sew cuffs, collars and pant hems, you can convert the machine into free arm by removing the accessory storage compartment. The machine weighs 15 pounds. So you can assume that less plastic is used inside. The machine comes with a soft cover as well. The variety of stitches available on this machine is quite good, but the good things stop there. It isn’t an entirely user-friendly sewing machine. The threading isn’t as easy as I expected. I had issues with thread nesting as well. 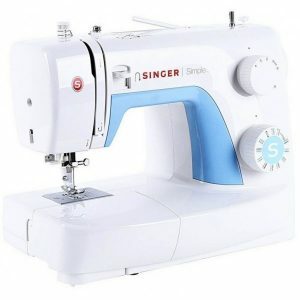 Even though Singer 3221 comes with most beginner friendly features, it misses out on a drop-in bobbin system. Instead of a drop-in bobbin, the machine comes with a side-loading one, which means you will have to remove the storage compartment every time you need to change the bobbin. Now, this will be an inconvenience for novice sewers. The feedback from the foot pedal is not great. Sometimes it is hard to control the sewing speed. Thread breaking and tension issues are some other common problems. Now I know why Singer 3221 is not as popular as Singer 2259. Singer 3221 may work fine for you, but I am not that impressed with how it worked out for me. I would consider 2259 as a better machine, even though it comes with 2 less stitches and lacks a 1-step buttonhole. Another alternative you can consider in the same price range is the Brother XM2701 with 27 stitches, 1-step buttonhole, automatic needle threader and drop-in bobbin. It was the most economical sewing machine released by Brother in 2014.